Two Mizzou Advantage areas rolled into one! Check out the new National Academies Press book Improving Food Safety through a One Health Approach. Globalization of the food supply has created conditions favorable for the emergence, reemergence, and spread of food-borne pathogens-compounding the challenge of anticipating, detecting, and effectively responding to food-borne threats to health. In the United States, food-borne agents affect 1 out of 6 individuals and cause approximately 48 million illnesses, 128,000 hospitalizations, and 3,000 deaths each year. This figure likely represents just the tip of the iceberg, because it fails to account for the broad array of food-borne illnesses or for their wide-ranging repercussions for consumers, government, and the food industry-both domestically and internationally. A One Health approach to food safety may hold the promise of harnessing and integrating the expertise and resources from across the spectrum of multiple health domains including the human and veterinary medical and plant pathology communities with those of the wildlife and aquatic health and ecology communities. The IOM’s Forum on Microbial Threats hosted a public workshop on December 13 and 14, 2011 that examined issues critical to the protection of the nation’s food supply. The workshop explored existing knowledge and unanswered questions on the nature and extent of food-borne threats to health. Participants discussed the globalization of the U.S. food supply and the burden of illness associated with foodborne threats to health; considered the spectrum of food-borne threats as well as illustrative case studies; reviewed existing research, policies, and practices to prevent and mitigate foodborne threats; and, identified opportunities to reduce future threats to the nation’s food supply through the use of a “One Health” approach to food safety. Improving Food Safety Through a One Health Approach: Workshop Summary covers the events of the workshop and explains the recommendations for future related workshops. Great New York Times article on One Health! Dr. Lisa Fortier, our Niemeyer lecturer on September 21st, is featured. As is Dr. Jonathan Levine, who trained with Dr. Coates. Check out the new One Health/One Medicine Research Guide at: https://libraryguides.missouri.edu/onehealth . Includes information on the One Health Initiative; campus strengths; articles; books; statistics; and more! Congratulations to Trenton and Kate on new appointments! Consolidation of the veterinary and health sciences historical collections of the MU Libraries is underway. The collections will be curated by a librarian with an outstanding reputation for scholarship in the history of veterinary medicine. Trenton Boyd has accepted a new position in the MU Libraries: Distinguished Librarian Curator of Medical and Veterinary Historical Collections. The appointment is the culmination of forty-two years of veterinary librarianship as Head of the veterinary library. Trenton is well-known for his scholarship in veterinary history and his long-term, visionary leadership in the field of veterinary librarianship at the national and international levels. In his new role, Trenton Boyd will highlight publications of historical interest related to veterinary and medical sciences housed in the MU Libraries, bringing visibility and scholarship to the veterinary and health sciences historical collection. Trenton will be relocating to the Health Sciences Library to be in close proximity to the collections. Trenton’s duties will include curating the archives of the College of Veterinary Medicine, and he will continue to be available for any historical questions you may have. Kate Anderson will assume the role of Interim Head, Veterinary Medical Library, based on her seven years of successful service as Specialized Services Librarian in the Health Sciences and Veterinary Medical Libraries. Over the past two and a half years, Kate has also served as the Mizzou Advantage Liaison for the MU Libraries. Check out this new article in JVME on searching the veterinary literature. A thorough search of the literature to find the best evidence is central to the practice of evidence-based veterinary medicine. This requires knowing which databases to search to maximize journal coverage. The aim of the present study was to compare the coverage of active veterinary journals by nine bibliographic databases to inform future systematic reviews and other evidence-based searches. Coverage was assessed using lists of included journals produced by the database providers. For 121 active veterinary journals in the “Basic List of Veterinary Medical Serials, Third Edition,” the percentage coverage was the highest for Scopus (98.3%) and CAB Abstracts (97.5%). For an extensive list of 1,139 journals with significant veterinary content compiled from a variety of sources, coverage was much greater in CAB Abstracts (90.2%) than in any other database, the next highest coverage being in Scopus (58.3%). The maximum coverage of the extensive journal list that could be obtained in a search without including CAB Abstracts was 69.8%. It was concluded that to maximize journal coverage and avoid missing potentially relevant evidence, CAB Abstracts should be included in any veterinary literature search. Please note: as of 7/25, we don't yet have this article in the library. But we can get it for you! The Working Group on Expanding Access to Published Research Findings (U.K.) has recently published “Accessibility, sustainability, excellence: how to expand access to research publications.” It’s know as the Finch Report after chair Dame Janet Finch. Check it out online! The National Research Council has released Workforce Needs in Veterinary Medicine. Check it out online! WASHINGTON — Without immediate action, a new National Research Council report warns, the academic veterinary community could fail to prepare the next generation of veterinarians for faculty teaching and research positions as well as for jobs in state diagnostic laboratories, federal research and regulatory agencies, and the pharmaceutical and biologics industry. Although the supply of veterinarians is growing, more than half of veterinary students seek training in companion animal or pet medicine. In addition, increasing debt from veterinary education may inhibit graduates from pursuing Ph.D. training that would prepare them for academic careers, key jobs in the public sector, and some positions in industry. Cost-cutting measures at universities have adversely affected the ability of colleges and schools of veterinary medicine to hire faculty in less popular fields of veterinary medicine and to support graduate research training. A potential shortage of professionals with training beyond a Doctor of Science in Veterinary Medicine could impact the supply of veterinarians to fill jobs overseeing and enforcing food safety and animal health standards, conducting research in human drug development and advances in pet health, and participating in wildlife and ecosystem management, infectious disease control, biosecurity, and agro-terrorism prevention. For example, food-animal production is changing dramatically in the U.S. and abroad. Large U.S. producers need veterinary services to focus on “herd health” while small producers, who have difficulty collectively supporting a full-time veterinarian, need primary animal care. Having fewer veterinarians in rural areas raises concerns about the level of animal disease surveillance in the field, which is critical to the prompt detection of outbreaks with potentially massive economic consequences. In developing countries, where meat demand is growing, crowding animals in hot, humid conditions places the health of animals, humans, and ecosystems at risk and is unsustainable. “The fact that 60 percent of all infectious diseases in humans are of animal origin and 75 percent of emerging infectious diseases in the last decade arose from animals underscores the importance of maintaining expertise in other areas of veterinary medicine,” explained Kelly. Addressing these challenges depends on the profession’s commitment to promote and develop diverse career paths in veterinary medicine and on the efficient delivery of veterinary services, which in some cases may mean using veterinary technicians to extend the field’s reach. The report’s recommendations center on partnerships among professional veterinary organizations, academia, industry, and government. These groups could form a national consortium or committee to focus on the economic sustainability of the profession in all sectors of service, education, and research, and develop a national veterinary curriculum that could be delivered electronically or through alternative measures. Veterinary medical organizations and the deans of veterinary colleges could work to increase the profession’s visibility, standing, and potential to address global food security, says the report. Establishing a health-oriented think tank with the goal of advancing sustainable food-animal husbandry practices, welfare policies, ecosystem health standards, and the capacity of the veterinary profession in the developing world is important and could help future generations of veterinarians collaborate across professions, disciplines, and cultures. A part of this body could also evaluate the competencies required of U.S. veterinary graduates to address the global challenges of food and water safety and security, the impact of urbanization on food supply systems, and the health of wildlife and ecosystems. The study was sponsored by the Association of American Veterinary Medical Colleges, American Veterinary Medical Association, American Animal Hospital Association, Burroughs Wellcome Fund, and Bayer Animal Health Inc. The National Academy of Sciences, National Academy of Engineering, Institute of Medicine, and National Research Council make up the National Academies. They are independent, nonprofit institutions that provide science, technology, and health policy advice under an 1863 congressional charter. Panel members, who serve pro bono as volunteers, are chosen by the Academies for each study based on their expertise and experience and must satisfy the Academies’ conflict-of-interest standards. The resulting consensus reports undergo external peer review before completion. For more information, visit http://national-academies.org/studycommitteprocess.pdf. A panel roster follows. On your PubMed results screen, you’ll now see year information and image search information in the right-hand column. 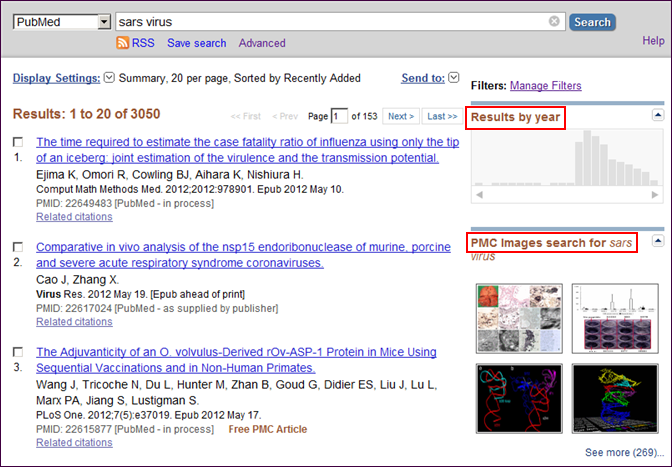 PubMed “Results by year” and PubMed Central “PMC images search” tools will soon display in the discovery column for all PubMed users (see Figure 1). Figure 1: PubMed results with “Results by year” and “PMC images search” tools. The “Results by year” timeline tool will display for search results with 10,000 or more citations. 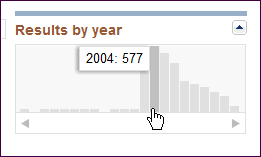 Mouseover the bars in the timeline to display the number of citations for each year, click the right and left arrows to display older or newer years, and click the individual bars in the timeline to display the results for a single year (see Figure 2). Figure 2: Mouseover for the PubMed “Results by year” timeline tool. 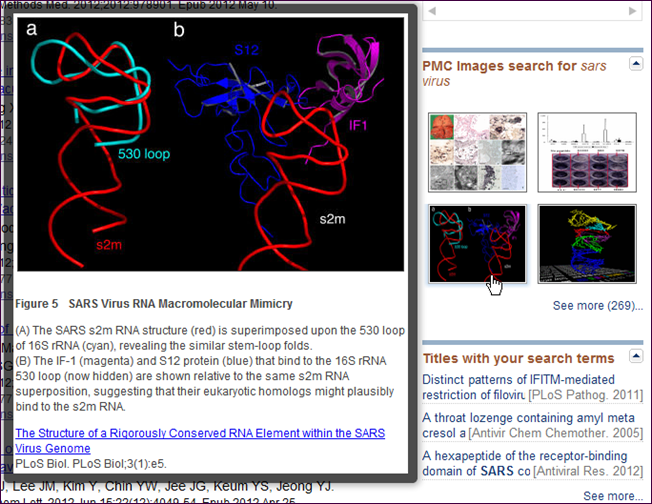 The “PMC images search” tool will display for PubMed search results that meet a number of criteria, e.g., results with a minimum of 250 citations, filters are not active, the search does not include Boolean operators, the search retrieves a minimum of 4 relevant images calculated using a term weighted algorithm. To enhance the size of an image, mouseover the thumbnail in the tool (see Figure 3). Figure 3: Mouseover of an image in the “PMC Images search” tool. Click within the enhanced image box to display the PubMed Central article for the image. The PubMed discovery column tools may be modified in the future. home Cycle of Success, Zalk Veterinary Medical Library Congratulations, Trenton! Trenton is the guest editor of the latest volume of the international journal Historia Medicinae Veterinariae (Vol. 36, No. 1-3, 2011). The issue is on “Veterinary Medicine as Portrayed on Postcards” and features a selection, in color, of approximately 240 veterinary postcards from around the world. As you know, Trenton has been collecting veterinary postcards since 1973 and has about 3,000 postcards pertaining to veterinary medicine, broken down into over 50 subcategories. The Index-Catalogue of Medical and Veterinary Zoology (ICMVZ) is an historic compendium of parasitological literature and a key resource for researchers in emerging diseases and global animal health. It comprises more than 100 publications with about 20,000 pages of references. With funding from the National Library of Medicine, Oklahoma State University and Texas A & M digitized the Index-Catalogue and made it freely available online and electronically searchable.